A robber who thought he’d got away with his crime was nabbed after he used easily recognisable stolen money to pay a court fine. Donald Dejarnette had previously stolen thousands of dollar bills from a Californian restaurant. But unfortunately for him, the Homestead restaurant had a special custom where customers wrote special messages on the notes, which were then stuck up on a message board in the eatery. Having stolen the board worth $8,000, 34-year-old Dejanette apparently neglected to think about the signatures on the money when he handed some of it in to pay a court bill. As if it was trying to live up to the reputation for wacky japes set by cartoon mice, a non-cartoon mouse has been taunting an old man in America and stealing his dentures. 68-year-old Bill Exner, from Waterville in Maine, has been plagued by the mouse for some time now. Three times he has captured it, only for it to escape three times, like the A-Team. The third time he tried to incarcerate it, it not only escaped, but also ran off with his lower dentures. The false teeth were eventually recovered after the family had to pull apart a section of the wall that had a small mouse hole in it. 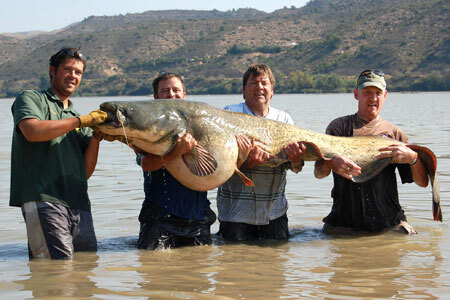 It sounds like a fisherman’s tale but an angler has landed one of Europe’s biggest catfish. Alan Melhuish spent half an hour reeling in the [8 foot long, 224 pound] giant on the River Ebro near Barcelona. The highway between Whatawhata and Pirongia [New Zealand] was expected to be closed until about 1pm today after a truck and trailer unit carrying glue rolled and crashed. Waikato road policing manager Leo Tooman said the unit was on its way from Wellington to Auckland on SH39 when it rolled near Ngahinapouri about 5.30am. Police were today still investigating the cause of the crash. The vehicle rolled…spilling a small amount of the Bostik adhesive being transported. The driver escaped without serious injury. Garden-proud inmates at Cardiff prison have won a £1,000 voucher for luxury bathroom goods. Their ticket was picked at a prize draw at the Cardiff in Bloom awards, after their entry came second in the community building garden category. The win caused a ripple of laughter at the awards evening at City Hall, which saw some 250 individuals and organisations compete. The Prison Service said no decision had been made on the voucher. Burke Jensen moved to Kennewick about a year ago, bought a nice house in the country south of the city and began to settle into a new job at Energy Northwest. Then came the call five months ago to serve his country in Kuwait. So Jensen, who says he is an involuntarily mobilized reservist, headed off, leaving behind a pregnant wife, a young son and a 2.5-acre lot with not a spot of landscaping on it. Now, Lt. Jensen is being told to get an irrigation system and landscaping on his property as soon as possible or face legal action from the Oak Hill Country Estates Homeowners’ Association. “I really don’t give a expletive where he is or what his problem is,” said Chick Edwards, owner and developer of the 47-lot subdivision at the south end of Oak Street in Kennewick. “It doesn’t matter to me,” said Edwards, who insists Jensen has violated terms of the homeowners association covenants requiring that landscaping be completed within one year after an occupancy permit is issued for a home. 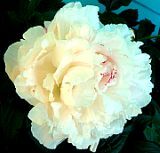 There’s another article at this site. Something about Nazi Democrats. Want to go for a ride? In a paper boat? A Chinese schoolteacher is preparing to cross the 112 mile-wide Taiwan Straits in a paper boat. “Not only is the whole boat made of paper, but the glue is an organic material – cooked flour soup,” he told the Straits Guidance Daily. Zhu says his boat will be nearly 6ft long, the bottom will be 2ins thick and it will be strong enough to carry two people. 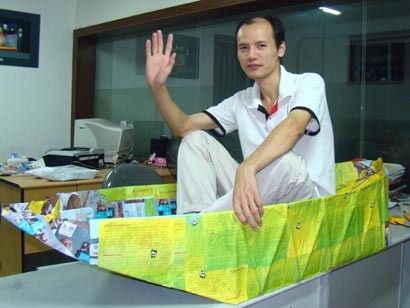 He first tested a paper boat in August 2005, sailing on the Mingjiang River for 50 miles in 11 hours, from Meishan city to Leshan city. October 9, 2008 Posted by oldstersview | People, Strange	| boat, paper | Comments Off on Want to go for a ride? In a paper boat? A US woman needed hospital treatment after she was shot in the leg by her own stove. Cory Davis, 56, of Sekiu, Washington state, had just stoked her cast-iron stove when something inside it exploded. She heard a loud bang and was struck by something on the inside of her left calf, reports the Peninsula Daily News. “I kept thinking, jeez that was one fast hot coal flying at me,” she said. “But it wasn’t a coal.” It was part of a…shotgun shell that had been accidentally placed in the stove along with some newspaper. Ms Davis said a case of ammo had spilled out in her home a month ago and one shell must have been inside the newspaper she used to light the stove. October 9, 2008 Posted by oldstersview | People, Strange	| shot, stove | Comments Off on War of the stove?